Miriam Yeung (楊千嬅) attended the 37th Hong Kong International Film Festival opening ceremony held on March 17, 2013. 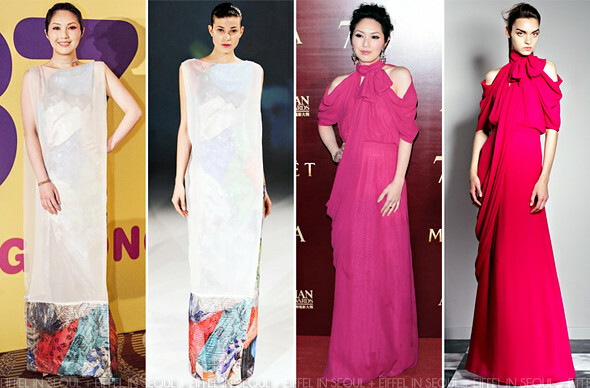 The Hong Kong actress and Canto-pop singer wore a Hussien Chalayan gown from Spring/Summer 2013 collection. Slick-back hairstyle to complete her look. The following day, she attended the 7th Asian Film Awards held in Hong Kong Convention and Exhibition Centre wearing a gorgeous bright pink gown with exposed shoulders from Viktor & Rolf Resort 2013 collection. While the Hussein Chalayan dress may not be flattering to her figure, the color of her Viktor & Rolf dress was simply striking. The star looked much more radiant too.